Feeling a little meteor-starved lately? Me too. 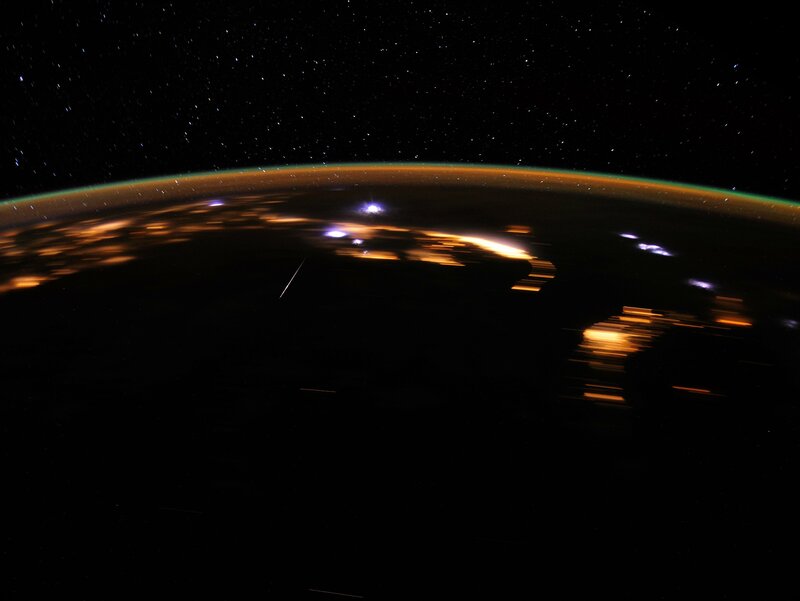 It’s been a meteor shower desert since the Quadrantids of early January. That’s about to change. This weekend brings the celestial version of April showers with the annual appearance of the Lyrids. The Lyrids ding the bell at maximum strength this weekend April 21-22 (Sunday night-Monday morning in the Americas) hurtling meteors at the modest rate of 10-20 per hour from a point in the sky not far from bright Vega in the constellation Lyra. While some showers spread their meteor crumbs over several days, the Lyrids’ peak activity lasts less than a day. The western hemisphere – particularly the western half of North America – is favored this year. There will be a small price to pay for the show. The Lyrid radiant, the point in the sky from which the showers members radiate, rises in the east rather late – around 10:30 p.m. local time. Then there’s the bright gibbous moon, which has a habit of drowning out fainter stars and meteors alike. That makes the best time for viewing the shower after moonset or around 4 a.m. Monday morning. Since dawn begins about 5, you’ll have one good hour. That’s plenty of time to snag at least a few flaming motes of Comet Thatcher. Like most meteor showers, the Lyrids have a parent and single parents are the rule. For the Lyrids, it’s Comet Thatcher, discovered on April 5, 1861, a week before the start of the Civil War, by amateur astronomer A.E. Thatcher observing from New York City. Later it was found to be linked to the Lyrid meteor shower. Each year in late April, Earth passes through centuries of dust shed by the comet’s tail. When bits of Thatcher flotsam strike the air some 60-70 miles high, they burn up in flashes of meteoric light. Comet tears. All meteors are worthy of keeping an eye on, but bear in mind that the Lyrids are no Perseids, the famed summertime shower offering up to 60 meteors per hour under dark skies. But what they lack in numbers, they make up in reliability and surprise. Records indicate that people have been watching the Lyrids for at least 2,600 years, the longest of any shower. Our oldest descriptions come from the Chinese who penned that “stars fell like rain” on March 16, 687 BC. Apparently the shower was more active in the past and has since evolved into a minor display. But there have been occasional surprises, and that’s what keeps the Lyrids interesting. On April 20, 1803 a fire bell roused Richmond, Virginia residents from their beds to witness a similar rain of stars when up to 700 meteors per hour were seen. Other Lyrid outbursts occurred in 1922 (100 per hour), 1945 (100/hr), 1982 (90/hour). Last year’s peak hit 37 per hour from a dark sky site. Now and then, Earth encounters a thicker band of comet debris left behind by Comet Thatcher, suddenly increasing the meteor count by many times and just as suddenly dropping back to the usual 10-20 per hour. So here’s the bottom line. Don’t expect a big blast, but do avail yourself of the leisurely pleasure of meteor watching and the possibility of seeing pieces of a comet that rounds the sun only every 415 years. Find a spot where artificial lights is at a minimum, dress warmly and head out around 3:30 a.m. Monday. Set up a comfortable lawn chair and have tea or coffee and a blanket at the ready. You’ll do well to face south or east. Now recline back to allow a fulsome view of the sky above and wait for a few well-deserved ooohs and aaahs. hi Bob, thanks for this writeup! it helps! one question though – i will be observing this from south india, and i read that the peak time of a meteor shower is always given in Universal Time. In that case, should the times that you have mentioned in your article (viz. 10:30am local time, before dawn, etc.) be converted in indian standard time? As per my almanac, at 12:30am (after midnight), Lyra would have risen *and* the moon would have set. So would we be able to see the meteor shower then? thanks in advance! Any chance we’ll see any in the southern hemisphere (New Zealand)? I live in Denmark, so what time should the Meteor Shower start? Can you please help me with that, as soon as possible? Btw. if my country is in a whole other timezone, which day should I be outside then? i live in indonesia , the Lyrids meteor would slam indonesia ? what is local time?? i’m in mountain. Previous PostPrevious Astrophoto: Space Station Flies Through the Moon!